“Economic development and growth depend on a country’s young people. With most of their working life ahead of them they make up about a third of the working-age population in the typical emerging market and developing economy. But the youth in these economies face a daunting labor market—about 20 percent of them are neither employed, in school, nor in training (the youth inactivity rate). This is double the share in the average advanced economy. Were nothing else to change, bringing youth inactivity in these economies down to what it is in advanced economies and getting those inactive young people into new jobs would have a striking effect. The working-age employment rate in the average emerging market and developing economy would rise more than 3 percentage points, and real output would get a 5 percent boost. A two-pronged strategy focused on better learning opportunities and improved job prospects for young people is needed. Secondary and postsecondary schooling has doubled over the past 25 years in the average emerging market and developing economy, which is impressive. But it will take further improvements in education and learning opportunities to close the gap with advanced economies, respond to technology-driven changes in the nature of work, and cope with aging populations. At the same time, young people who are not in school need help so they can find their place in the labor market. 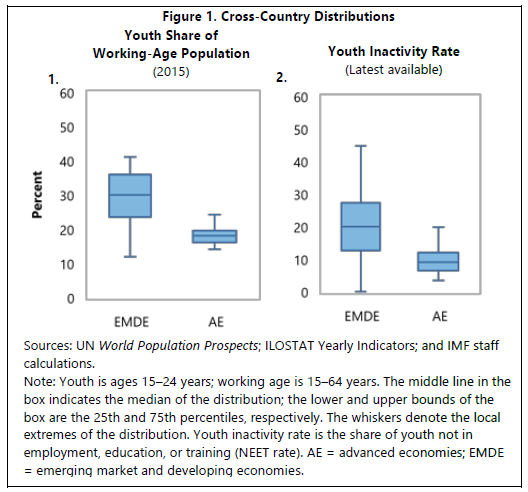 This discussion note draws on new analyses that use macro- and microeconomic data to look at how broad structural policies, including labor and product market reforms, can address challenges in the youth labor market. Poor labor market outcomes for youth can be traced in part to large and persistent gender gaps. Young women’s inactivity rate, at about 30 percent in the average emerging market and developing economy, is almost twice that of young men. Some of this can be explained by the effects of marriage and children on young women’s employment prospects. The right policies can make a difference. For example, when women receive equal employment protection under the law, the gender gap in employment and participation is smaller; women’s outcomes are better without men’s outcomes being worse—for workers of all ages. In areas that are more vulnerable to automation fewer young men—and to a lesser extent, older men—participate or are employed. As technology makes it easier to substitute capital for labor, men may contend with a tougher labor market. Targeted expansion in the social safety net, enhanced general education, and active labor market policies may help the young better cope with such disruptions. Aggregate youth unemployment in all economies is twice as sensitive to overall demand as adults’, underscoring how countercyclical macroeconomic policy can help protect young people from economic fluctuations. As emerging market and developing economies continue to develop and formal employment—which is more sensitive to the business cycle—rises, prompt countercyclical policy will be imperative.